В связи с отменой перехода на летнее/зимнее время посвящается. В Mac OS X настройки часовых поясов находятся в двух местах: /etc/localtime и /usr/share/icu/icudtXXX.dat. /etc/localtime, который является сиволической ссылкой на /usr/share/zoneinfo/[установленная time zone, например Europe/Moscow], задает настройки временных зон для консоли. Системные часы, приложения Mail и прочие берут настройки тайм-зон из /usr/share/icu/icudtXXX.dat. 30 октября 2011г. у меня случилось следующее: в Terminal’е и различных консольных утилитах время правильное(localtime был заранее обновлен), а в Mail, системных часах и прочем отстает на час. Mac OS X users and faithful readers of TUAW know that there is great power found in the command-line, but one of the greatest advantages of OS X’s UNIX heritage is the secure shell (SSH) client and server. From the Apple Matters article on SSH tunnels for the common man: “SSH is a network protocol that provides secure communication between two computers.” Its power comes from the ability to create an encrypted tunnel through which a client can send many types of internet traffic. The Lifehacker article on setting up an SSH server covers the steps necessary to roll your own SSH server whether you are running Windows or OS X. Parts one and two of the Apple Matters series on SSH tunnels provide a lot of useful information on SSH as well as creating an SSH tunnel for encrypting traffic. One such use that has not yet been covered is how it is possible to stream your iTunes library across the internet while using software that is either built-in or available for free. This tutorial will get pretty technical and assumes that you already have an SSH server and you know how to access it from a remote location (e.g. from work). If you are already past the point of just setting up an SSH server and are asking yourself “what now?” then read on to find out how you too can listen to your tunes at work even though they are trapped at home. In a nutshell the command above says to create an SSH tunnel that forwards the service running on port 3689 at the remote server to port 36890 on your local computer. To test the connection you can telnet to “127.0.0.1 36890” and then hit <enter> twice. This should list a killed connection to DAAP-Server: iTunes; if it does then your tunnel is up and everything is ready to go. 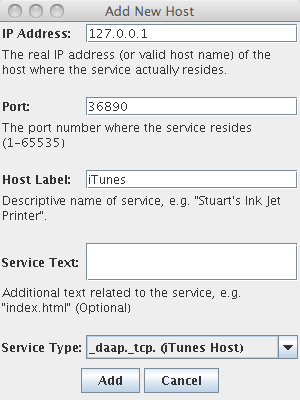 If this does not work check to make sure that iTunes is running on the remote server, make sure library sharing is enabled or try verifying port 3689 is open at the remote server. At this point you can click on the newly added iTunes library share and start jamming out to the new Britney Spears Killers album. Keep in mind that if you are on dial-up or a similar low-bandwidth connection, the music may skip and problems could occur for users on the network where the SSH server resides. However, if you’re rocking with a good connection and tons of tracks to choose from then you should have no problem finding some music to listen to — probably annoying all of your co-workers. One more thing: if you happen to have Xcode installed and want to go a step further with this little project it is incredibly easy to fix the OS X binary. 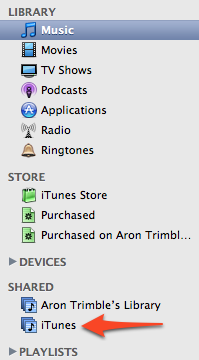 All you have to do isdownload the source, open the project in Xcode, and re-build. Also, if you don’t need an interactive terminal session open for the purpose of sending other commands to the SSH server you can add the “-N” flag to the command so it reads “-NL” instead. Your Mac has many secret abilities when you first turn your computer on, and you may have already discovered one or two of these, especially if you’ve ever had to troubleshoot startup problems. This article is a simple list of the startup commands I’ve used over the years. Hopefully it will serve as a quick guide for you. To perform a startup key combination, you simply hold down the keyboard key(s) corresponding to the appropriate purpose when you turn on your Mac. In an ideal world, you hold the keys down while pressing the power button, but some tricky combinations likely require you to press the power button and then very quickly hold down the keys on the keyboard (before the startup sound finishes playing). As you already know, the normal boot sequence is: black screen –> gray screen –> gray screen with Apple logo –> gray screen with Apple logo and spinning gear –> desktop. You should continue holding down these keys until either the gray screen switches to something other than the Apple logo, or if your command needs to boot the computer, hold them down until the Apple logo appears with the spinning gear. Lastly, remember that resetting PRAM/NVRAM will restart your computer, so once your computer reboots while you hold down the Command-Option-P-R keys, you can let go. Hope this helps! Некоторые приложения позволяют спрятать свои икону из Dock через настройки. Это может быть полезно, если она также присутствует и в верхнем меню (menubar). Зачем ее прятать? Чтобы избавится от малоиспользуемых элементов и облегчить Dock. Но что делать, если программа не имеет такой опции? К счастью, есть универсальный метод спрятать любую иконку из Dock. Давайте рассмотрим способ на примере Twitter для Mac. Для этого найдите приложение Twitter.app, кликните на него правой кнопкой и выберите Показать содержимое пакета → Contents → info.plist. Найдите параметр LSUIElement и замените <false/> на <true/>. Чтобы вернуть все назад проделайте обратную операцию.